I visited Maki restaurant last week for the first time since two months or maybe more and I was in for many surprises. 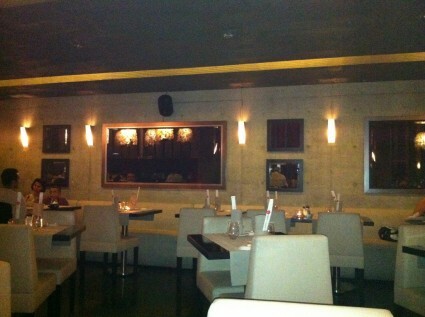 1- They added mirrors on the wall which used to be empty before. It looks much nicer now. 2- Their menus are on iPads now instead of the endless booklet we were handed before. As you can see in the picture above, the menu’s sorted into categories making it very easy to choose from. 3- Last but not least, they changed the whole dessert menu and introduced new items. I tried the Tiramisu and the Chocolate Fondant and they were delicious. I was told there’s a new dessert called Beirut in Maki Kuwait branches but it was not available. Aside from those changes, food is still as good as always, and customer service is excellent. So you get surprised by mirrors? btw my opinion on their menus is that it’s incredibly annoying to use. Instead of a Maki App or a PDF menu with links and a navigation bar, it’s basically just photos divided into albums which makes navigating through them annoying and frustrating. The iPad is also heavy, you don’t feel it when you’re lying down with the ipad resting on you or on your laps but when you’re leaned across the table in the regular menu reading position the iPad is too heavy. It’s definitely a gimmick nothing else. For the iPads, I did not find them annoying at all specially that you get to see what you’re ordering, but the menu was much smaller than the previous one and I was told not all items were copied just yet. So I am not sure what to think when there are 50 pictures in one album for example. It could be indeed annoying but I still prefer it over the old one. A Maki App would be the ultimate solution though. It doesn’t even have to be an app (where they have to wait for iTunes approval). It could simply have been a website (perhaps hosted locally) that was optimized for ipads..
You don’t need apple approval to install the app since you don’t need to submit app to the store. You could manually copy apps onto ipad using developer account bypassing apple. In any case it’s not an issue getting apps approved by apple, takes just a couple of days. 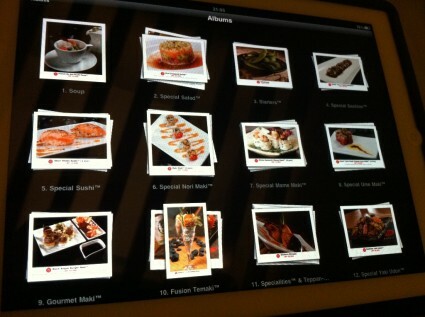 Najib every kind of dish is an album for example sashimi is an album, dessert another, makis another, specials anoter etc.. So you have to keep moving from one album to another and it gets hard to keep track of which albums you’ve previously checked. An better way of doing it would be either a local website like Mostafa suggested or lay everything out in a PDF with links which allow you to navigate easily. Te best would be an app which is easy to do as well. and to add to the app idea that Mark previously suggested, wouldn’t be more interesting if in the same app you could mark the items you want so you can later see on a sort of an order page all the items that you want, all displayed as a list. that would come in handy, especially in a sushi restaurent, where there’s a lot to choose from. another better idea is that you can order it wirelessly, without the need of a waiter’s assistance. great idea using the iPad though in a restaurant. just needs some fine tuning. Mark Y: thats a good idea… a check out kinda system. I spent a lot of time flipping between different albums trying to remember where i saw what dish when i was trying to order. Actually I ended up asking for the regular menu which they luckily still had and ended up using that to make my orders. If you check najibs picture you’ll see there are at least 12 albums to go through and in each album go knows how many pictures..
They’re handing iPads instead of menus? What a waste! It only costs 10K each!